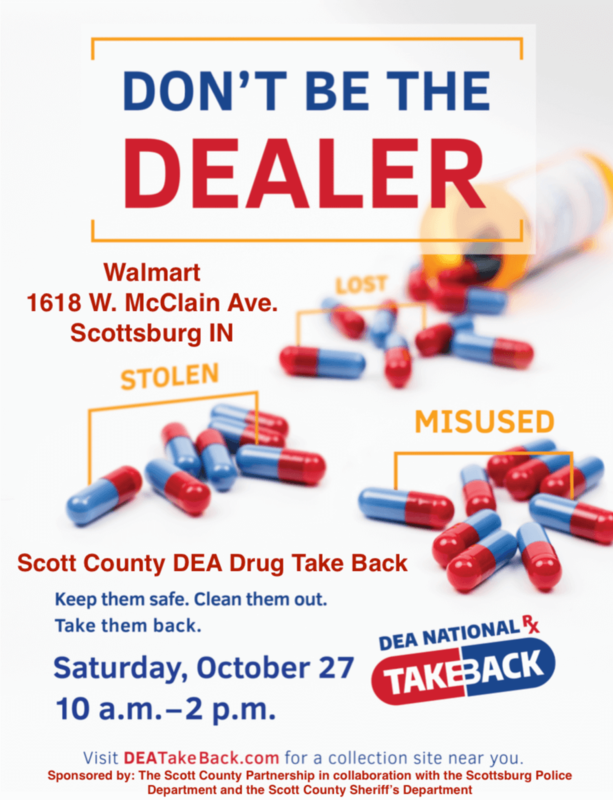 [SCOTTSBURG, IND] – On Saturday, October 27, from 10 a.m. to 2 p.m. the Scott County Partnership and the Drug Enforcement Administration, in partnership with the Scottsburg Police Department and the Scott County Sheriffs’ Department, are sponsoring a Drug Take Back Day that will give the public its 16th opportunity in 8 years to prevent pill abuse and theft by ridding their homes of potentially dangerous expired, unused, and unwanted prescription drugs. Bring your medications for disposal to the Scottsburg Walmart at 1618 W. McClain Ave., Scottsburg, IN. All prescriptions, over-the-counter medications, vitamins, and liquids will be accepted, and there will also be a sharps container on site. The service is free and anonymous, no questions asked. Last April, Americans nationwide did their part to reduce the opioid crisis by bringing the DEA and its more than 4,600 law enforcement partners a record-setting 949,046 pounds—474.5 tons—of potentially dangerous expired, unused, and unwanted prescription drugs for disposal at thousands of collection sites. Scott County collected over 214 pounds this last spring. For more information about the disposal of prescription drugs or about the October 27 Take Back Day event, go to the DEA Diversion website or contact LeAnn Walker at the Scott County Partnership at (812) 752-0980.